Even before the recent plummeting of the price of oil, Russia's economy was showing signs of slowdown and stress. With oil prices now in the neighborhood of $30-$35 per barrel, and maybe with additional declines still to come, Russia's economy is already in recession and probably headed for worse. 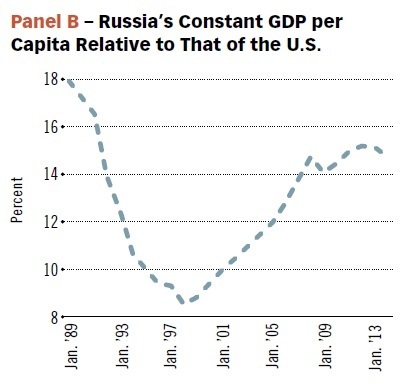 Guillaume Vandenbroucke offers some graphs that put the long-term course of Russia's economy in some useful perspective in "Rising Productivity, Declining Population Impact Russia’s Economy," which appears in the January 2016 issue of the Regional Economist published by the Federal Reserve Bank of St. Louis (pp. 10-11). Russia's economy has a truly terrible period in the 1990s, in the aftermath of the breakup of the Soviet Union. 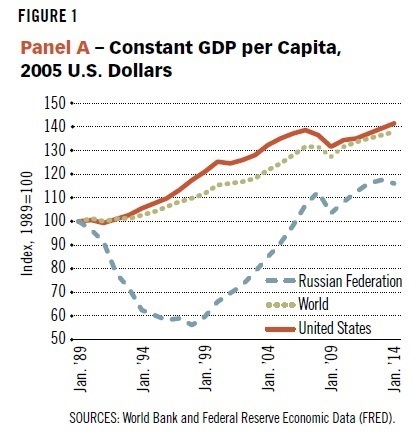 This figure shows how the level of per capita GDP has evolved in the Russian Federation, the US, and the world economy since 1989. 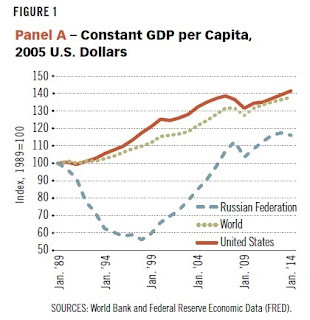 Another perspective on the same data is to look at Russia's per capita GDP relative to the United States. Russia started out at 18% of the US level, dropped by 9% of the US level, and is now back to about 15% of the US level. In both figures, you can see that Russia's period of catch-up growth has slowed substantially in the last five years or so. Here's Djankov's figure showing the slowdown of Russian growth rates over five year intervals up through 2010-2014. As I'll argue in a minute, the forecasts he was citing last fall for a stagnant Russian economy in 2016 are probably too optimistic. Vladimir Putin’s career at the helm of Russian politics started in 1999 and will likely continue beyond 2018, the year of the next presidential elections. Under President Putin’s leadership—the longest of either the Soviet or modern Russian era—the Russian economy has shifted from crony capitalism to state capitalism, distinguished by five features. First, state ownership in sectors like finance, energy, transportation, and the media have increased—reversing a previous trend towards more private property. The role of the state in industry has also been strengthened through the creation of vertically-integrated national champions. Second, strategic energy exports are increasingly used as instruments of foreign policy. In Europe, Russia has undermined the rival gas pipeline project Nabucco—which was supposed to supply Central and Southern Europe—by buying Turkmen gas and redirecting it into Russian pipelines. Russia also diversified its exports to include markets in China, Japan, and Korea by building the Trans-Siberian oil pipeline, as well as the Sakhalin–Khabarovsk–Vladivostok gas pipeline in the Russian Far East. Under Putin, Russia has also restored its nuclear industry, with $50 billion allocated from the federal budget to nuclear power since 2003. Nuclear projects—for example in Bulgaria, Hungary, and Slovakia—serve as diplomatic weapons. Third, plentiful revenues from extractive industries have obfuscated the need for structural reforms in Russia since 2004, the end of Putin’s first presidential term. Pension, healthcare, and education reforms have stalled, and efforts to decentralize public finances were reversed towards the end of his second term in 2008. With economic growth stagnating recently, however, reforms may become a necessity. Fourth, the share of extreme wealth in the Russian economy has risen, with 111 Russians on the 2014 Forbes World’s Billionaires list, up from 42 a decade earlier. These billionaires may account for as much as a third of the country’s wealth. Large infrastructure projects like the Sochi 2014 Olympics, the 2018 World Cup, and the Kerch Strait bridge linking Russia with Crimea, are entrusted to a group of billionaires with close links to the president. Fifth, Putin’s assertive foreign policy has incurred economic sanctions by the European Union and the United States. So far, the Russian economy has weathered these sanctions better than most economic analysts predicted. Still, the resulting stagnation has brought about a policy of import substitution. This has increased corruption for government-funded projects, especially in procuring financing for projects with dubious rates of return, and has reduced access to new technologies in many industries. Retaliatory trade policies have increased the prices of basic food and consumer products and have made it more difficult for foreign companies to invest and operate in Russia. Adverse population dynamics have contributed to the decline in the labor force, while low statutory retirement ages have reduced workers’ incentives to extend their working life. 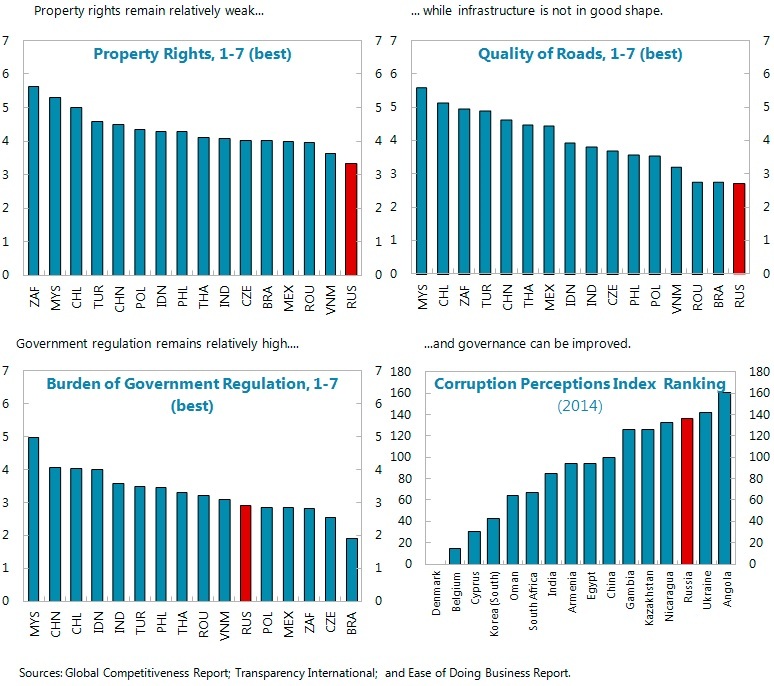 Administrative barriers, high regulation, weak governance (including perceptions of corruption and weak property rights protection), and poor infrastructure have limited investment and growth. The significant presence of state-owned enterprises (SOEs) in key sectors of the economy has also made it difficult to increase competition and efficiency. Several new anti-crisis initiatives aimed at supporting different sectors through subsidies, guarantees, restrictions on the participation of foreign producers in public procurement, and import substitution-like polices, have introduced additional distortions which will put a drag on growth. Finally, the banking system is highly concentrated, lacks depth, and is inefficient at channeling savings to investment. Back in August 2015, the IMF estimates of Russia's economic growth were similar to those mentioned above by Djankov: that is, the IMF was expecting -3.4% growth in 2015, followed by 0.2 percent in 2016. But those estimates were based on assuming the world price of oil was above $60/barrel through 2015 and 2016, while the world price of oil now seems likely to be half that level or less, perhaps even through 2017. The IMF report include a useful figure giving a sense of the connection between oil prices and Russia's economy. The dashed red line shows the price of oil, measured on the left-hand axis. 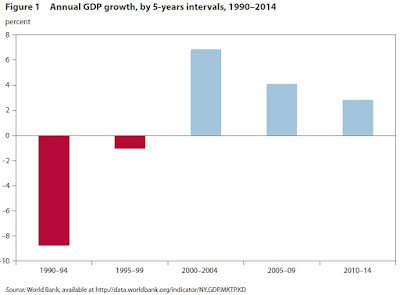 The blue line shows the annual growth rate of Russia's economy, measured on the right-hand axis. When the price of oil was rising from 2000-2007, Russia's economy was growing at 8-10% per year. When the the price of oil dropped in the worldwide Great Recession, so did Russia's economy. 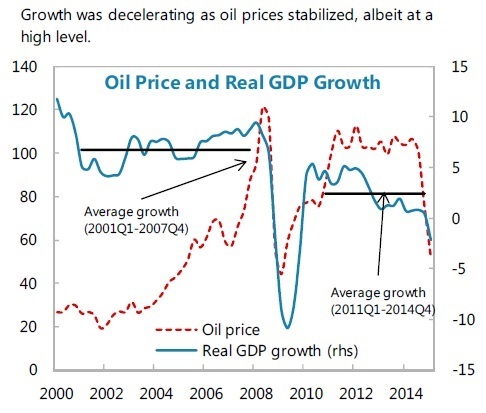 The price of oil rebounded, but it was no longer rising, and Russia's rate of growth was slower and declining. To think about what will happen for Russia's economy in 2016, keep extending the red dashed line down--because the price of oil is now lower and still falling. The blue line that is already in recession for 2015 seems very likely to worsen. The IMF also note many of the structural shortcomings in Russia's economy that are limiting its resilience and growth. Here's a figure with some comparisons. When it comes to property rights, Russia ranks below Vietnam and Mexico; when it comes to quality of roads, Russia is behind Brazil, Philippines, and India; when it comes to burden of government regulation, Russia is behind Indonesia and China; and when it comes perceptions of corruption, Russia appears worse than Nicaragua, Kazakhstan, and Gambia. The discussions by Djankov and the IMF imply a broader policy agenda, but I wanted to take note of a particular issue for Russia at the intersection of its education system and its labor markets. This issue is discussed at greater length in a paper by Lilas Demmou and Andreas Wörgötter called "Boosting Productivity inRussia: Skills, Education, and Innovation," published as OECD Economics Department Working Papers No. 1189 in March 2015. 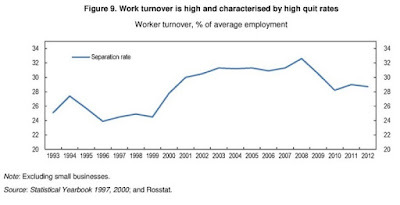 The authors point out that Russia's has a fairly flexible labor market, with fairly low unemployment and decent job creation, but "many new jobs are also of low quality." New job creation often tend to be low productivity and low-paid, jobs, often in the informal economy, not much protected by labor laws, without benefits or options for building skills and training. One result is a high level of wage result is high wage inequality, higher than in the US economy. 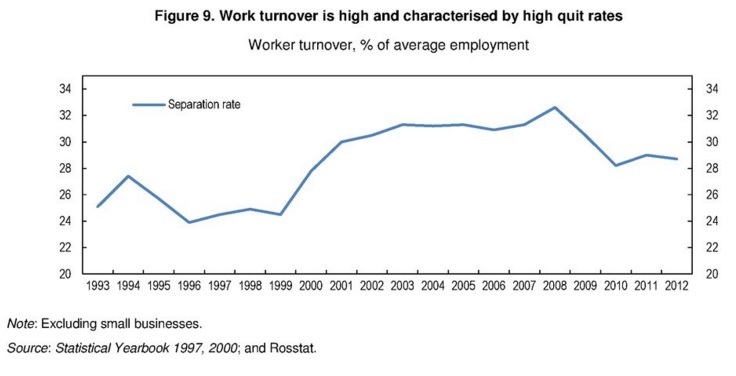 Another outcome is very high labor market turnover, often with more than 30% of Russia's entire workforce separating from their job in a given year. Russia has high levels of educational attendance, up through the "tertiary" college and university level. It continues to have some strong examples of high-quality of scientific and technical research. But much of the education system is of low quality. Demmou and Wörgötter cite an international survey of employers that ranks the quality of Russia's education system 78th out of the 140 countries surveyed. The education system is often disconnected from needs of labor markets in general. Moreover, it's hard to start new high-productivity firms that would offer a promise of higher-paying jobs in a Russian economy that is politically oriented, dominated by billionaires running "national champion" firms, with lousy infrastructure and poor governance, and struggling with international sanctions. How Many in the Gig Economy? Do Business Cycles Die of Old Age?